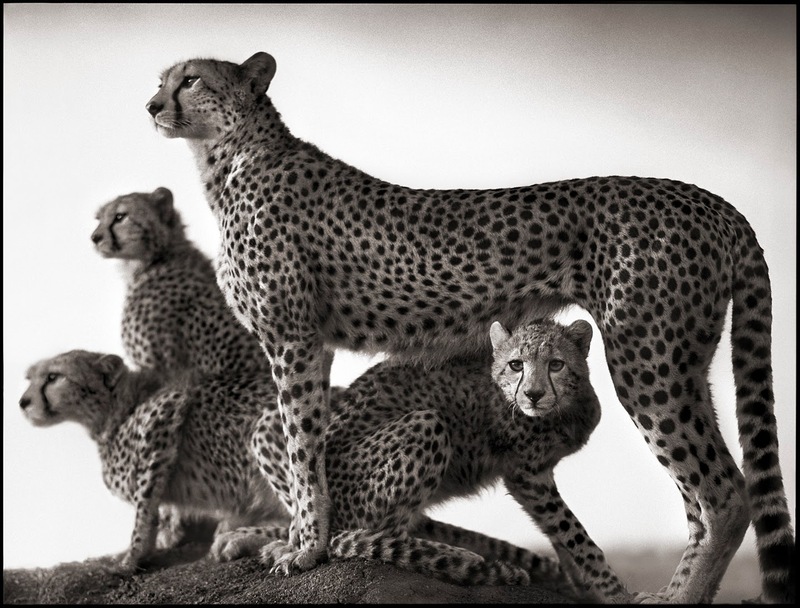 Nick Brandt has long been dedicated to photographing the vanishing wildlife of East Africa – creating a final testament to the land and animals and the crises they face at the hands of man. 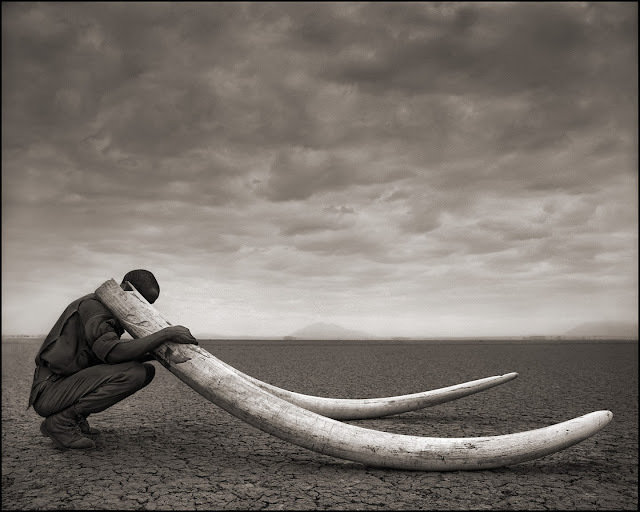 Brandt set out over ten years ago to produce a trilogy of books on the subject, photographing the exquisite animals in painterly light while illuminating the dark reality of these wild animals as the demand for ivory, rhino horns, bush-meat and animal pelts climb to an alarming rate. In 2010, Brandt started Big Life Foundation, a cross-border anti-poaching operation that now patrols two million acres of the Amboseli-Tsavo wildlife in Tanzania and Kenya. Erin Azouz: Your background is in painting and filmmaking. What inspired you to make photographs as opposed to creating films to tell the story about the vanishing wildlife of East Africa? 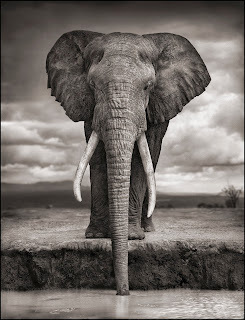 Nick Brandt: The animals came first. Not the photography, but the animals. Or to elaborate, my love of animals came first. Photography was merely the best medium to convey my love of and fascination with them. I first visited East Africa in 1995 while directing “Earth Song,” a music video for Michael Jackson. I fell in love with the place and with the animals. That’s not very surprising – it has a similar effect on many people. But that experience shifted my focus in terms of what I wanted to say about the world. So I spent the next few years trying to find feature film projects that dealt in sophisticated ways with the subject matter of animals and the environment. But it was hard to find any story in which the "money people" were sufficiently interested. Directing is a frustrating business. Vast, precious tracts of your life, when in theory you are at your most creative and energetic, are consumed with projects that ultimately never see the light of day. You’re dependent on the money people to be able to create. And even if you’re fortunate enough to finally get that money, the compromises involved can take you a long way from your original vision. For so many in the film industry, you’re living for tomorrow, not in the present, unable to simply do what you are desperate to do: create. Photography, however, allows you to just go out and create how you want, what you want, when you want. You’re answerable to no one. You’re in control of your creative life. Joy. EA: What inspired you to start Big Life Foundation? NB: In July 2010, I returned to Amboseli National Park in Kenya, one of the photographic locations for the third book in my trilogy, for the first time in two years. Over the previous eight years, I had spent many months photographing many of the elephants that live there. While I was there, I also discovered that 49 year old Igor (as named by Cynthia Moss of Amboseli Elephant Research), the elephant in my Elephant Drinking photo (left), had been killed the year before – as had Marianna, the matriarch leading her herd boldly and purposefully in the photograph below. Over the coming weeks, there was a lot of bad news. Over the rest of the year, the roll call of big bull elephants killed by poachers came thick and fast. It wasn't just a case of if an elephant was going to get killed, but when. It was quite shocking to discover this in Amboseli – one of the most important and famous ecosystems in Africa, with the most spectacular remaining population of elephants to be seen in East Africa (in my opinion, on the whole continent). 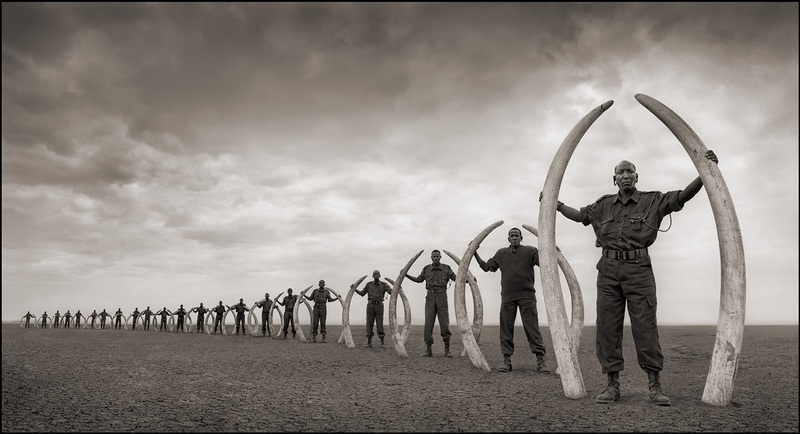 From 2008, the poaching of animals (especially elephants) has dramatically escalated across much of Africa. There has been a massive increase in demand from China and the Far East; ivory prices have soared from $200 a pound in 2004 to more than $2,000 and counting today. It is now estimated that an excess of 35,000 elephants – 10% of Africa's elephant population – are being slaughtered every year. And the killing is not limited to elephants. There are now just 20,000 lions left in Africa – a 75% decline in just the last 20 years. All in all, there is a continent-wide apocalypse of animals in full force. No longer able to sit back and allow the destruction to continue, I co-founded Big Life Foundation in September 2010 with one of the most respected conservationists in East Africa, Richard Bonham. The Amboseli ecosystem that straddles both Kenya and Tanzania became Big Life’s large-scale pilot project. You can see 22 of Big Life’s rangers holding tusks of elephants killed at the hands of man in the photo below – all tusks from elephants, I hasted to add, that were killed before the Big Life teams started patroling the region. 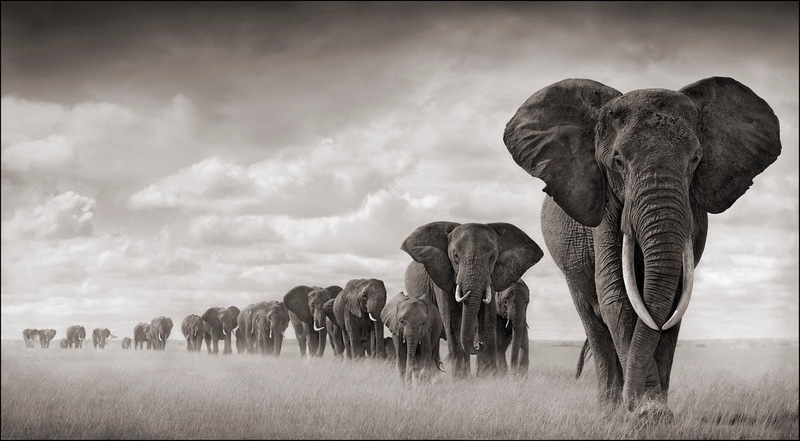 The photo is composed as a deliberate echo of the elephants in the earlier photo, in happier times, crossing the plains. Today, three years later, Big Life is the only organization in East Africa that has coordinated anti-poaching teams operating on both sides of a country's borders. The animals don't pay attention to borders. Nor do poachers. So neither can we. 310 fully-equipped rangers in 31 outposts now protect two million acres of the ecosystem. With the aid of multiple patrol vehicles, tracker dogs (the first to be used for conservation in Tanzania), night vision equipment and aerial monitoring, this new level of coordinated protection for the ecosystem has brought about a major, dramatic reduction in poaching of all animals in the region, with numerous arrests of some of the worst, most prolific long-term poachers in the region. EA: You've recently received a lot of press on your photographs of the calcified birds at Lake Natron in Tanzania. How did you discover the lake? Can you describe the experience of finding the birds that had washed up along its shoreline? NB: I visited the lake while traveling more stark areas of East Africa taking photos for Across The Ravaged Land. It was dry season, so the waterline had receded. As a result, I discovered the creatures washed up along the shoreline. I thought they were extraordinary – every last tiny detail perfectly preserved down to the tip of a bat's tongue, the minute hairs on his face. The entire fish eagle was the most surprising and revelatory find. 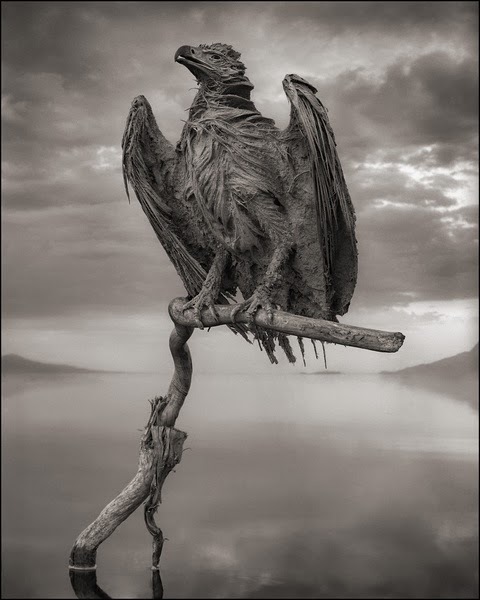 No one knows for certain exactly how they die, but it appears that the extreme reflective nature of the lake’s surface confuses them, causing them to crash into the lake, sort of like how birds accidentally fly into reflective plate glass windows. We found entire flocks of quelea, small finches, washed up on shore in a 50 yard stretch of shoreline. 100 dead birds along one stretch of 50 yards. So clearly, they all died at once. The water has an extremely high soda content, so high that it would strip the ink off my Kodak film boxes within a few seconds. The soda and salt causes the creatures to petrify, perfectly preserved, as they dry. In the case of the creatures which had become petrified in an interesting pose, I took them as I found them on the shoreline, and then placed them in 'living' positions, bringing them back to 'life.' Reanimated, alive again in death. EA: Now that the trilogy is complete, what's next? NB: After 12 years of working on the trilogy, a long break, theoretically. I say theoretically because I need to devote more time to Big Life. But my intention is always to photograph the animal and natural world, the environment, and the crises facing them. It remains my mission. An exhibition of Nick Brandt's work is currently on view at photo-eye Gallery in Santa Fe running through November 30th. More of Brandt's work can be viewed online at photo-eye Gallery. Support Big Life if you want to see these incredible animals in your lifetime or if you would like to give your children the chance to see them.